Proton launched it’s iconic two-door hatchback, the Proton Satria back in December 1994. The Proton Satria was based on the Mitsubishi Colt and came in 1.3 litre and 1.6 litre variants. Two years later, it received it’s first minor facelift, with the number plate relocated to the hatch instead of on the bumper. Four years after it’s introduction, the sporty Satria GTI variant was released, featuring a sporty bodykit, Lotus tuned ride and handling as well as a powerful 1.8 litre twin-cam engine making 140 horsepower. 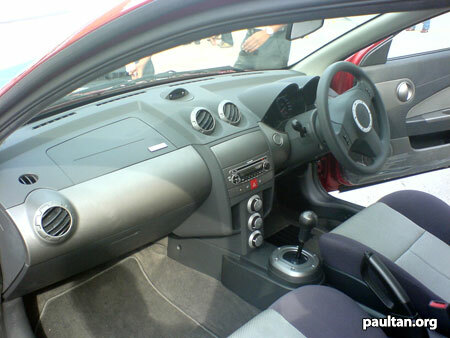 In 2003, Proton introduced the Satria Special Edition which featured a new bodykit and a minor interior facelift. In 2004, the R3-tuned limited edition Satria R3 was launched. The Satria is one of Proton’s more successful models, achieving near-cult status in hatchback-loving countries like the UK. We have been looking at spy photos of the Proton Satria Replacement Model for more then a year now, and the wait is now over. 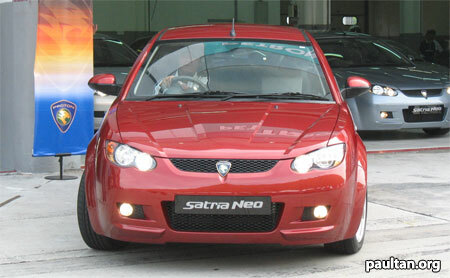 Proton has launched the Satria Replacement Model and it has been given the name Proton Satria Neo. Let’s have a look at the new Proton Satria Neo. Proton Satria Neo R3 Details and Photos – new limited edition tuned up Satria Neo! 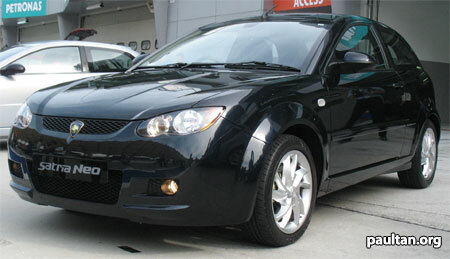 The Proton Satria Neo is an all new platform developed from scratch. It is not based on the Waja/Gen2 chassis or the old Satria chassis. However for the sake of better economies of scale, it does share some components with the Proton Gen2. The new Proton Satria Neo’s exterior design projects a stout and intimidating image. Projector headlamps are of the Proton tiger eyes design first seen on the Proton Gen2. The headlamps are a 4-headlamp projector system which uses H1 bulbs. These H1 bulbs have a 2000-hour lifespan. Of course, the silhouette was designed to provide a good drag coefficient of 0.35, front lift coefficient of 0.01 and rear lift coefficient of 0.05. This is an improvement of the old Satria’s drag coefficient of 0.405 and the Satria GTI’s drag coefficient of 0.395. This will improve performance and fuel consumption. 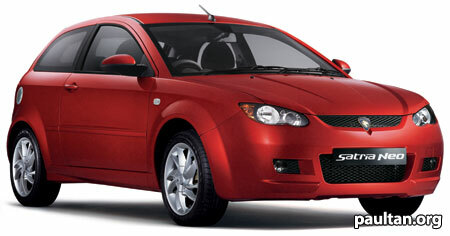 The Proton Satria Neo 1.6 comes in specification levels: the M-Line and the H-Line. Both features 16 inch alloy wheels wrapped with Continental SportContact-1 tyres in 195/50/R16 88V size. The alloy wheels are of the bling bling design. Proton prefers to call this design a turbine design. This turbine design is symmetrical, which means the left and right sides of the car use different designs to ensure the turbine always “spins” forward. I still think they’re horrible, but then again wheels are something that are easily replaced and is one of the first things to be changed on a car. 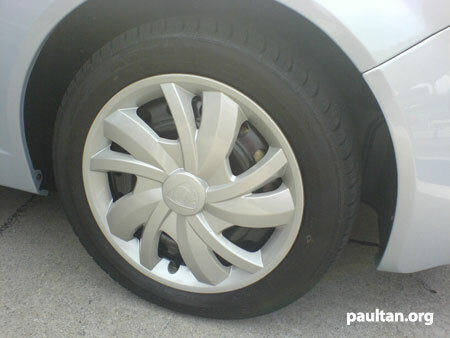 The Proton Satria Neo 1.3 L-Line base model uses 15 inch steel rims with bling bling turbine wheel covers. The tyres provided are Sime Astar Prima 195/55/R15 85V. 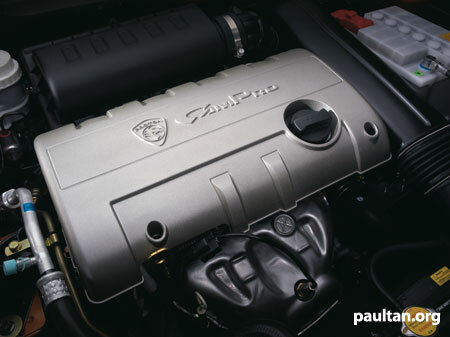 The Proton Satria Neo uses Proton’s Campro engines. 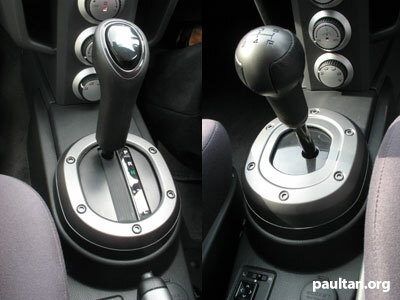 These are the same ones found in the Proton Gen2 and the Proton Waja Campro. The 1.3 litre Campro offers 94hp at 6000rpm with 120Nm of torque peaking at 4000rpm and the 1.6 litre Campro gives you 110hp at 6000rpm with a torque figure of 148Nm at 4000rpm. This is for a car that weighs about 1146kg for the 1.3 L-line manual up to 1184kg for the 1.6 litre auto. I took the car for a spin around Sepang. The 1.6 litre was a fun drive although it is seriously nothing fantastic. Not mind-blowing, just adequate. Performance was quite on par with my classic Proton Satria’s 1834cc SOHC engine. The Campro engine’s revs felt like it had a slightly heavy flywheel, though I suspect it must be because the engine has not fully run in yet. The engine is a bit noisy. At high revs from 5000rpm onwards it screamed with a very metallic sound which was too loud even with my helmet on. I think if you change the intake system to something less restrictive it would sound nicer, but in stock form it sounds abit painful at high revs towards the redline. Not very pleasant. But the power is there. As for the 1.3, I cannot imagine how the Gen2 1.3 auto’s performance is as I have not test driven that yet. But the Satria Neo is a lighter car than the Proton Gen2, and the 1.3 auto is really underpowered. The engine struggles to go under load but you don’t really go anywhere. I highly recommend you stay away from the 1.3 litre models unless you’re a really really slow driver who is very patient. By the way, the Campro’s torque dip at low RPM ranges is still there. To help with the 1.3’s performance, the manual transmission for the 1.3 model has a revised final drive ratio of 4.33 instead of the 1.6 model’s 4.05. Notice the huge difference in the acceleration statistics for the 1.3 automatic and the 1.3 manual model. I think the 1.3 manual model would have acceleration numbers almost as bad as the 1.3 automatic if it were not for the new gear ratios. Hence the huge difference as compared to the difference between the 1.6 auto and the 1.6 manual. The brakes are good, as expected from the sporty drive Proton promises. You’ll be happy to hear both the 1.3 and the 1.6 litre models come with disc brakes on all four wheels. The brakes are ventilated at the front, and solid at the rear. The Proton Satria Neo’s front disc brakes are larger than the Proton Gen2’s. The 1.6 high-line model comes with anti-lock brakes, while the 1.6 M-line and the 1.3 L-line models do not. 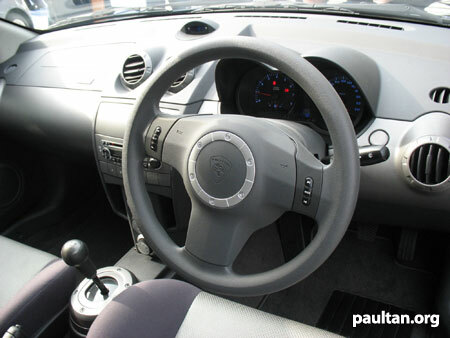 Previously, spyshots and patent filings have indicated that the Satria Neo would come with a cream based interior like the Proton Gen2. 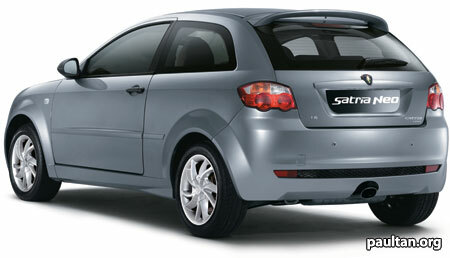 Thankfully this was revised and the Proton Satria Neo now comes with a grey interior. A cream interior really does not lend to a sporty look. Proton calls this a Tempest Grey colour scheme. The interior is a combination of dark grey, light grey and silver. 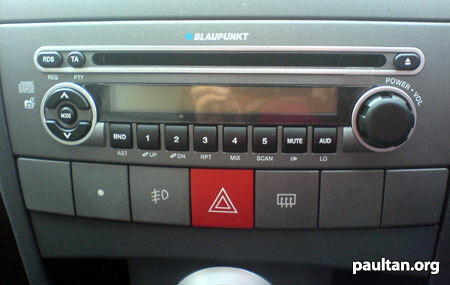 Air conditioning controls are arranged in a vertical arrangement below the integrated Blaupunkt CD player. The air cond vents are circular in shape. You twist the outer ring to adjust the amount of air flow. The vents can be adjusted independently from the outer ring for airflow direction. While I do not know if this is an original idea, it’s a clever design which reflects the minimalist concept of the interior. It is functional too once you get used to it. Interior air conditioning is an improvement over the Proton Gen2’s air conditioning system where there is a delay while the air conditioning system cools the air. This delay is not present in the Proton Satria Neo. 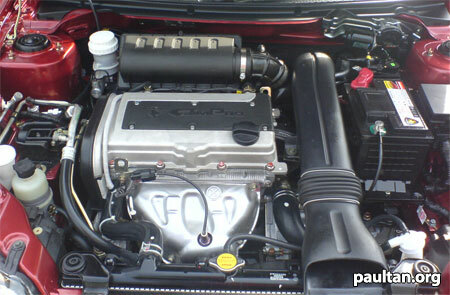 The Proton Waja Campro also features this system. 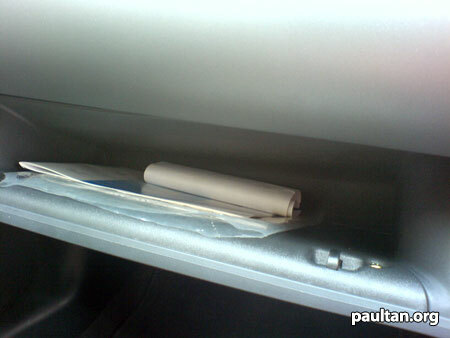 There is a glove box but it’s really very tiny. I think it’s just enough for you to put a case with your audio CDs and a Smart Tag transmitter in it. Gear console design has a metal trim around it, like the Satria GTI’s. I like how the ball of the manual gearshift fits into my palm. The meter panel is the standard symmetrical pod design used in all new Protons. The meter illumination is blue in colour. I’m not sure if this is a good idea since blue is a bit hard to focus on as a foreground colour. You can adjust the brightness of the meters via a dial to the right of the meters. 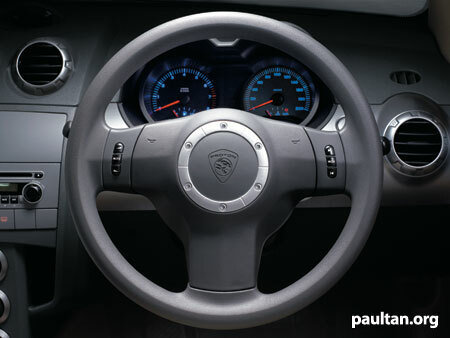 Steering wheel is a three-spoke design with a silver ring in the middle and a Proton logo in-set. The 1.6 models have audio controls built into the left and right steering wheel spokes. The dashboard meter features a digital trip meter in the middle. The trip meter also has a fuel computer funtion which shows distance to empty and average fuel consumption. The whole interior looks very minimalist and modern, and it gives me a sporty feel. The plastics are softer than the typical hard Proton plastics so at least that is an improvement. I wish they’d given the steering wheel a better feel too. Somehow it feels really bare bones in my hands. The impression I get is “budget, budget, budget”. The audio system is powered by a Blaupunkt CD player. The 1.3 model features FM and CD, while the 1.6 model has the additional capability to play MP3 files. The 1.6 model comes with 4 speakers, while the 1.3 model comes with only 2 speakers. This Blaupunkt CD player also has options to interface with a CD changer or an iPod. These functions are optional accessories. The Satria Neo’s bee sting antenna is an active system in the 1.6 model, it actively searches for signals in poor reception areas like basements where passive antennas do not work. Modern door inset design. The half-moon shaped door handle looks dodgy, and the door knob looks cheap. 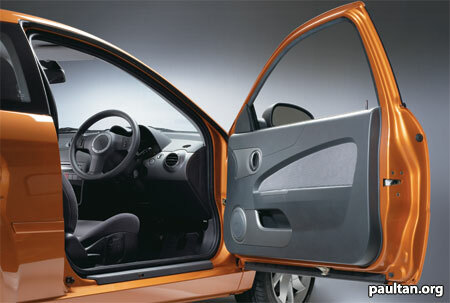 I prefer a design integrated with the door handle like the classic Satria’s. The interior is a bit cramped for me. I am 181cm tall. That’s about 5 foot 11 inches. When I got into the car, I had problems wearing my helmet for the track session. Sitting down in the front, my head was almost touching the ceiling of the car. With my helmet on, I could not even fit in the car properly. I had to slouch a little in my seat so that I could get the helmet on. This was the front, so imagine if I was sitting in the rear. 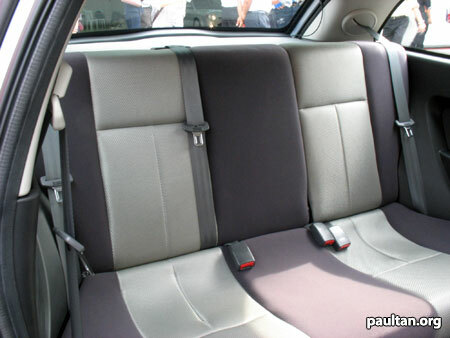 The rear legroom is abit larger than the original Proton Satria but too little to make a difference. This is definitely not a car for large people. It’s a two-door hatch, do not expect it to give you wonders in terms of interior space like a four-door sedan or even a Perodua Myvi. What about ride and handling? The Proton Satria Neo’s body is supposed to be 2 times stronger than previous Satrias and is built with high tensile steel. 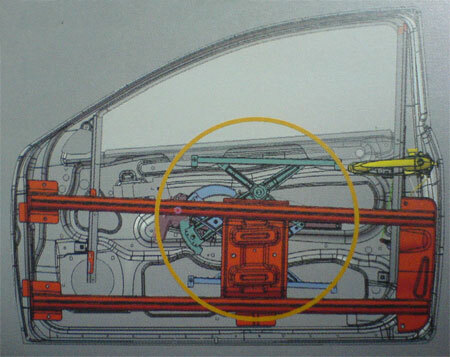 The Proton Satria Neo has a torsion ridigity of 13,300Nm per degree and a bending ridigity of 14,000Nm per millimeter. The front suspension is features MacPherson struts and the rear suspension is a multi-link setup with a rear anti-roll bar. 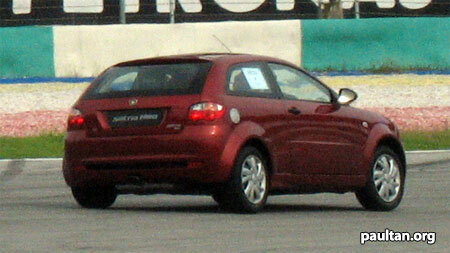 My experiences with the Proton Satria Neo on the Sepang F1 circuit impressed me. The body behaviour was typical of a Lotus tuned suspension, however I had some qualms about the steering feel. I had expected more of the car’s reaction time to my quick steering actions. Perhaps I had overestimated the advertised Lotus handling, the car did not respond as quick as how I expected it to. You will get used to the steering feel sooner or later. Let’s have a look at what Proton had done to improve the reliability of the Satria Neo. For one, the Proton Satria Neo has been tested at Spain’s stone pave circuit. The stone pave circuit like it’s namesake is a circuit paved with stone. It’s really rough and it shakes and stresses the car’s body and parts to ensure maximum endurance. The Proton Satria Neo underwent a 200,000km test on the Stone Pave Circuit, which is equal to 10 years of wear and tear. The Proton Satria Neo also comes with a 7-year anti rust corrosion warranty. 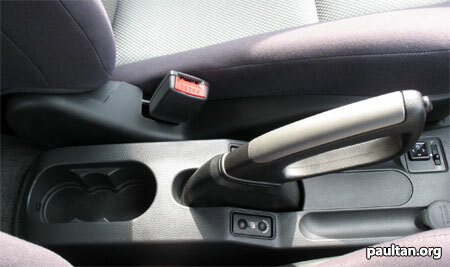 The power window switches are located in the center console area near the handbrake. The power window mechanism has been improved over the Proton Gen2 system and features a scissors type regulator which apparently provides for better reliability. The load bearing components are made out of stronger materials, and additional roller bearings reduce stress on the mechanism. There are also balance rails for the glass pane, and the motor is also an improved version. As for safety features, the Proton Satria Neo does offer SRS airbags, pre-tensioner seatbelts, electronic brakeforce distribution (EBD), and anti-lock brakes (ABS) but these are only offered on the Proton Satria Neo 1.6 H-Line model which is the top of the range. So I expect Proton will get some criticism for not making it standard on all models. For your car’s security, the H-Line model also comes with a CAPTOR alarm and immobilizer system. The Proton Satria Neo has also passed EuroNCAP, GCC for Gulf Nations and ADR for Australian crash test standards. Other creature comfort accessories include powered wing mirrors, front fog lamp for the 1.6 models, cruise control for the automatic transmission 1.6 H-Line model, steering wheel audio controls for the 1.6 models, a 12V power socket in the center console area, reverse sensors, ignition key reminders which alert you when you leave your keys in the LOCK or ACC position, and lamp warning buzzers when you leave the car with your headlights on. The hazard lights blink automatically when you open your door while the engine is running to alert oncoming traffic. The rear seats also fold down in a 60:40 configuration to allow extended boot space. The 1.6 model has rear headrests. I am disappointed at the lack of an armrest. In the place of the arm rest are cupholders. Expect aftermarket armrest accessories to be out soon. 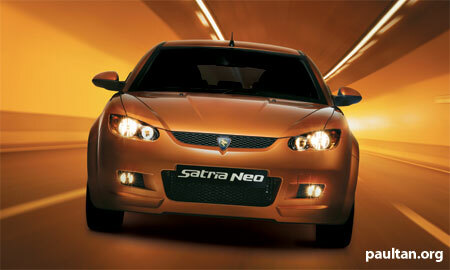 The Satria Neo comes in five colours, Liquid Orange, Brilliant Red, Twilight Blue, Iridescent White, and Metal Grey. To be honest, all the colours are nice making it hard for me to choose my favourites. But I seem to favour the red and blue the most. Twilight blue isn’t exactly the blue you expect, it’s almost black. Iridescent white is a very interesting colour. It’s like a mix of white and silver. All of them are excellent choices for the car. Good job Proton on the colour combination. So, how much will this car cost you? These prices are on the road with insurance. 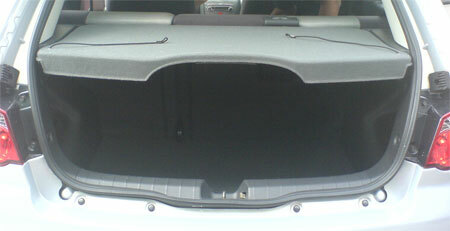 Rear seats for the 1.3 model. The 1.6 model has rear headrests. Right, yadda yadda. I’ve tried to detail the specifications as much as I can. Now what do I think about the car? Personally I think the car is a good buy for those in the market for a two-door hatchback in the 45,000 to 55,000 ringgit price range. There’s nothing else in that market range actually and the Satria is a little dated now. Evergreen! But the 1.3 and 1.6 litre engines leave something to be desired, and I am more of a performance guy (as most people who buy sporty hatches?) so I’ll wait to see what Proton’s Race Rally Research team has up it’s sleeves for the Proton Satria Neo’s raw horsepower and torque numbers. The car might also be a little uncomfy for large people like me. Kudos for the grey interior though. I heard this was a last minute decision change from the original cream interior. This is definitely Proton’s best interior look so far. Another shot of the interior. Proton logo on the passenger airbag compartment seems out of place. This might be Proton’s best car yet, and I can see it going in the right direction. If Proton improves with each model like this, I’d say the Waja replacement is going to be an excellent car once it finally comes around. Which is what the Malaysian market really needs right now actually, an economical comfortable 4-door family sedan. That fort is held by the Waja right now and that seems to be eaten away slowly by the Vios and City. The 1.6 and 1.6 H-Line versions feature a roof spoiler and rear wipers. 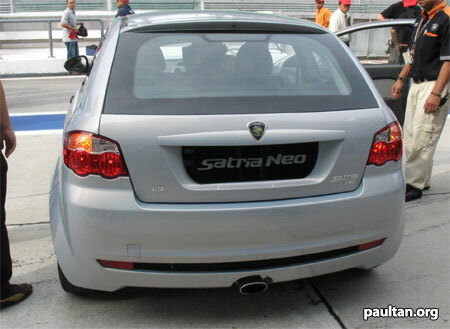 The Satria Neo’s boot, sorry this is not very clear. The Twilight Blue is actually a very dark blue, almost black. You can see the blue highlights under a bright sun. Proton intends to capture at least 0.5% of the growing 20-35 year old market segment with this Proton Satria Neo, which would be about 31,500 units a year.